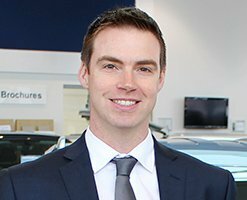 Mark Lincoln is the Miles Motor Group’s Marketing Manager. Father of two, dog owner and Rangiora resident, Mark joined the team in 2012 after working in various sales and marketing roles, including most recently as part of the Online Media team for Foodstuffs where he managed the PAK’nSAVE website and social media profiles. 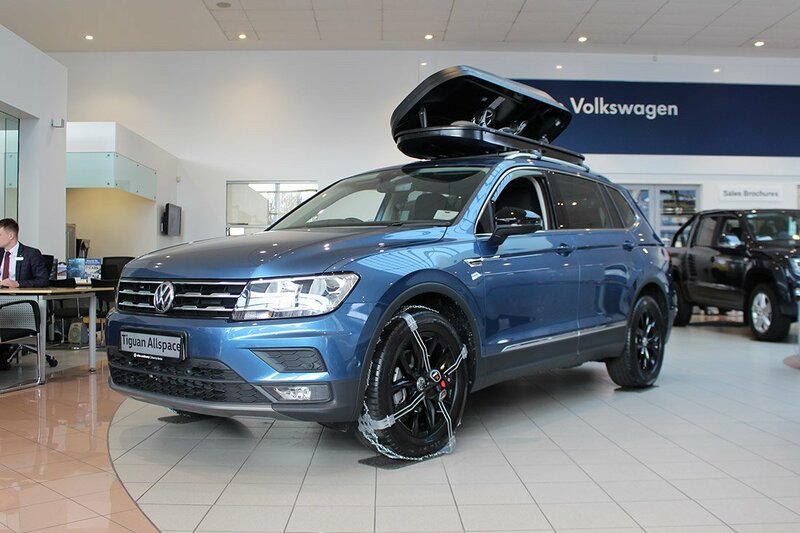 Mark much prefers talking cars rather than vegetables and is loving the use of a new Volkswagen as his daily driver. Follow his (and team’s) behind-the-scenes footage on his Instagram or the Miles Continental Instagram profile. Mark: A short while ago I wrote about my time with the Golf R-Line. 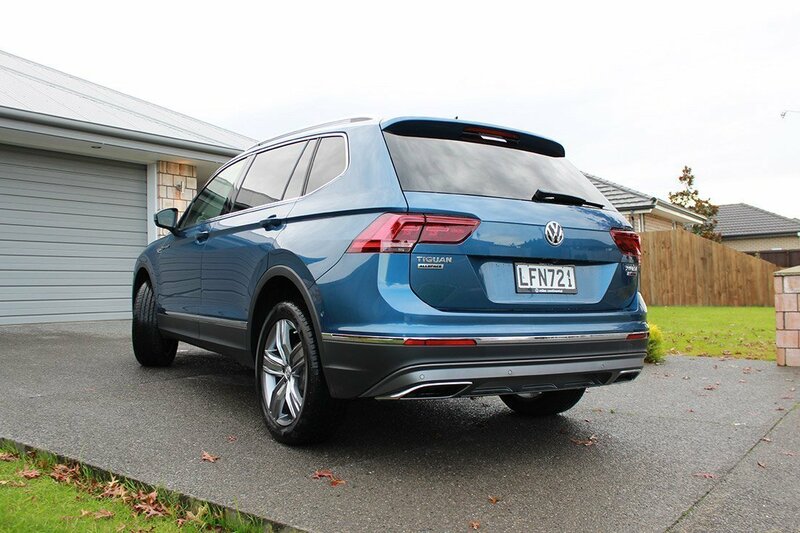 The time came to say goodbye to that one, but that moment was sweetened when I was handed the keys to a new 7-seater Tiguan Allspace. As a father of two with a dog, the Allspace is an ideal vehicle… but to be fair, I didn’t let my dog anywhere near this one, and the kids were only allowed in with a seat cover beneath their car seats! Still, it wasn’t hard to see how practical this car would be for large families or those who regularly help courier their kids’ friends around. Even the boot can be opened using a ‘virtual pedal’, i.e. wave your foot under the tailgate to open the boot. As a resident of Rangiora with an office in central Christchurch, my commute includes a great mix of city, motorway and country driving which really allows me to experience a lot of what the Allspace has to offer. On top of this, I tend to find you can experience more of a vehicle during winter; putting the heating (and heated seat) system to the test as well as advanced lighting (really – this is something that’s overlooked but really appeals to me) in terms of interior ambience and exterior practicality and style, and finally, less-than convenient road conditions. The Tiguan Allspace Highline has every feature that you’d wish for in a car, particularly if you drive a lot and you enjoy a relaxing drive. Here’s a rundown of my morning. I walk up to the car in the driveway and open the door – the car’s ‘KESSY’ keyless access system knows I’m approaching with the key and unlocks the car just as I pull the handle. If I were to push the button on the keyfob instead, the headlights would activate as well as puddle lights under the wing mirrors to welcome me to the car. Once inside, I push the start button and a message on the dashboard welcomes me (it knows it’s me from my key; my wife could have another key with her own personalisation settings). It’s dark, so the sharp white LED headlights switch on automatically, accompanying the LED daytime running lights. If it was raining, the windscreen wipers would activate as well. I turn on the heated mirrors and heated seats, both of which have a minimal ‘warm-up’ time. But it’s on the road that the support systems really kick in. I’m a huge fan of Volkswagen’s advanced driver assistance systems. While these are entirely designed to assist the driver rather than autonomously drive the vehicle, they’re so advanced that the vehicle really does – to a degree – drive itself. With Adaptive Cruise Control the vehicle stays a safe and comfortable distance from the car in front (more on that later), and with lane assist the vehicle stays within the lane should your attention waver. Not to mention the vehicle can parallel or reverse 90-degree park itself. These assistance functions can be deactivated through the main menu system, or accessed through a quick tap of the end of the indicator stalk. I’ve been asked by my wife – and also responded to a similar comment on our Facebook Page – as to why I would want these systems when I consider myself someone who really enjoys driving. To that, all I can say is that you need to experience these systems for yourself. After a few weeks or really getting a good feel for how they work, you’ll never look back. In fact, vehicles without these systems – and even those that have just basic cruise control with no radar input – actually verge on feeling dangerous. I’m still coming across new features, and often features you would have never realised how convenient they would be. The vehicle really showcases just how much Volkswagen’s designers and engineers have considered in the enjoyment of a vehicle. Here’s one example; after two months of driving, I realised that when you lower the volume of your audio streaming or USB audio to zero, the media system automatically pauses your music or podcast, and then starts it playing again as you raise the volume back up. Such a thoughtful feature, and particularly good for those who have family members that frequently interrupt your favourite song or important information in a podcast! Another example of this is the voice recognition button on the steering wheel. I tend to find car manufacturer’ s voice recognition systems to be just adequate without being particularly impressive, favouring the systems from Apple (Siri) and Google that have had much more investment and regular updates. 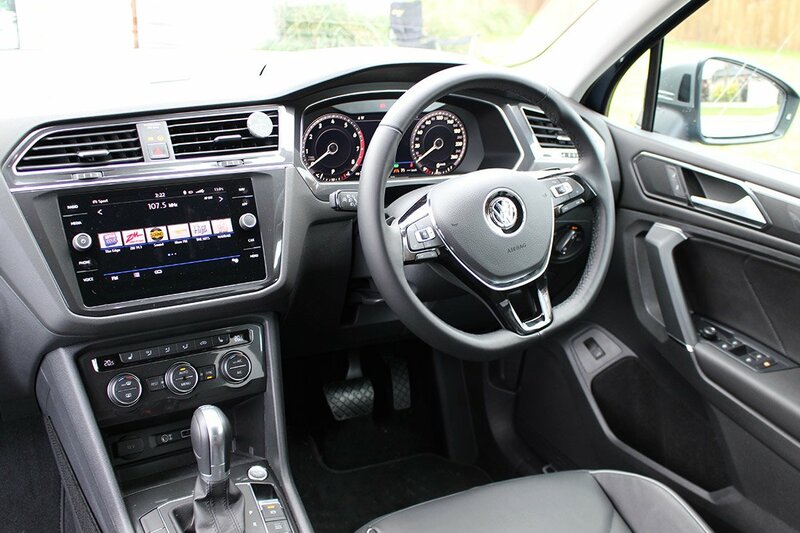 In this car, if you have Apple CarPlay or Android Auto connected for your smartphone, press the voice recognition button on the steering wheel and you’ll get the car’s own system. But hold that button down and you get your smartphone’ s voice recognition system instead. Clever! View this in the quick video I’ve put together. As mentioned, one more thing that separates Volkswagens from the competition – and something that I keep finding myself raving about – is Volkswagen’s Adaptive Cruise Control. Those with less interest in cars would be forgiven to think that each manufacturer’s moniker for ‘radar cruise control’ are just trademarked brand names to make them appear different to the rest, but the truth is that those systems can vary quite a bit. You’ll probably know that radar cruise control acts like regular cruise control but with the added function of slowing down to match the speed of the vehicle in front. What you may not know is that many cheaper systems only operate at fairly high speeds, designed almost exclusively for motorway driving (and so on my Rangiora commute, I’d only be able to use this briefly and would have to take over if there was traffic on the motorway). With Volkswagen’s Adaptive Cruise Control, the speed can be set from 30kph to 220kph (don’t forget, the German’s have the autobahn!) but will even operate right down to 0kph. Think about that – when driving along the motorway, onto city roads, and then even in stop-start traffic, you don’t need to use the pedals. At all. Someone pulls out in front of you? The system slows to fit them in and match their speed. Someone slams the brakes in front of you? The car will slow right down and then – if a collision would otherwise be imminent – sound an alarm and – if you still don’t take any action – slam on the ABS brakes. As a bonus, like any cruise control system you can use steering wheel controls to increase or decrease your set speed by one, but unlike other systems, you can use other buttons to increase and decrease the speed in increments of 10kph. I use this all the time, changing from a 100kph zone down to a 70kph, then 50kph, then with roadworks to 30kph, then up to 60kph, etc. All with just taps of the steering wheel controls while my feet rest on comfortably-placed foot holders alongside the pedals. Tip: in some Volkswagen models, when the vehicle comes to a stop in traffic and the engine shuts off (if you have stop/start active) then the engine will come back on when the radar sees that the car in front is starting to move but it won’t actually start to move forward unless you touch the accelerator. I noticed that in the new Allspace you just need to tap the res(ume) button on the steering wheel to start the car moving forwards again. Still no pedals! Back to the Allspace. 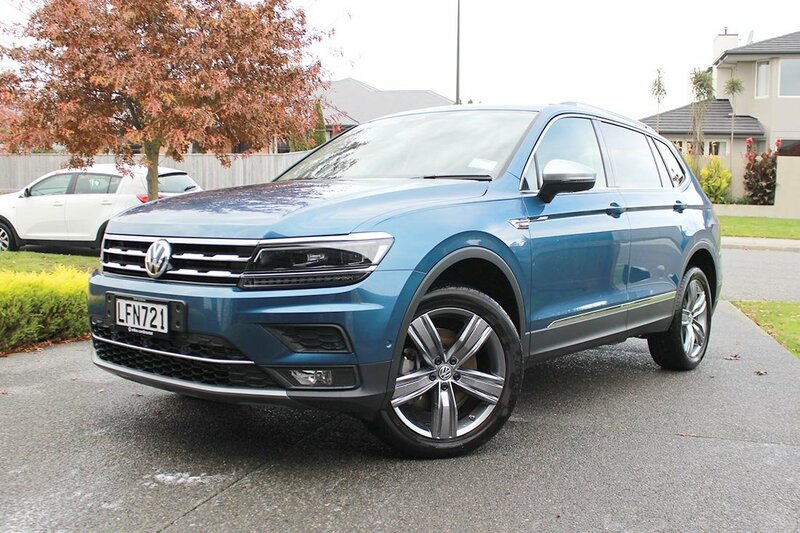 It’s a 7-seater SUV (Volkswagen’s only 7-seater – the new Touareg will remain a 5-seater luxury SUV), but doesn’t feel like the third row was crammed into the 5-seater as an afterthought. In fact, the 7-seater was designed at the same time, by the same teams, as the 5-seater. It’s 215mm longer than its smaller variant, with extra clever storage so that (again, unlike some competitors) you can store the extendable parcel shelf under the floor rather than removing it altogether and having to keep it clean in your garage. It’s there again when you need it in 5-seat mode and want to cover your rear luggage. The rear-row passengers have their own bottle holders, as well as a pocket that perfectly fit my iPhone. 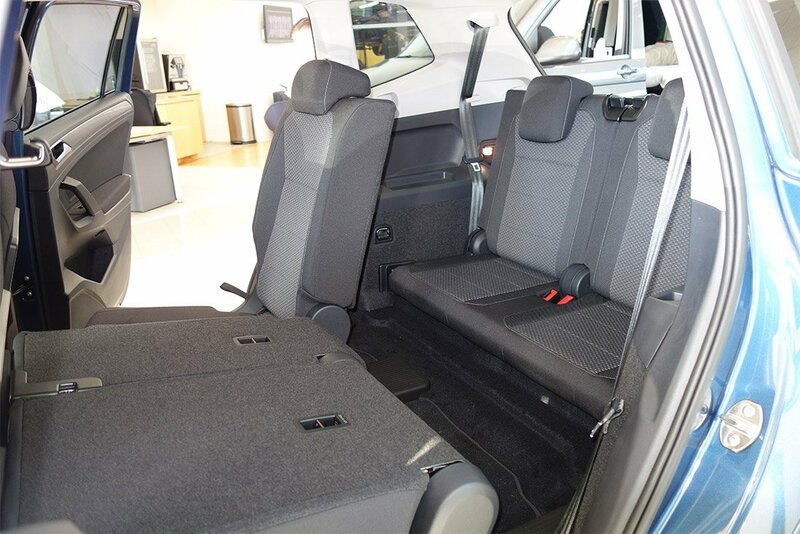 The centre row of seats can be adjusted to move them forwards and backwards, plus adjust the rear rest angle to allow for more space in the rear row, although – I’ll be honest – the back row isn’t intended for 6ft 2in adults like myself! If you need to pick up your two kids from football, and their two friends plus two parents need a lift, you’re sorted. And still with good room in the boot for gear. The Active Info Display in the Tiguan Allspace Highline adds a very nice touch. It can be customised with various views, for radio, phone, driving data, driver assistance and more, but I particularly like the navigation view which displays the map between two main dials (which can be made smaller to allow for more map). Even on a commute which I drive every day, the map displays road names which I like to keep an eye on and wouldn’t otherwise be aware of, and alternative routes which can come in handy for last minute detours (see traffic ahead? A quick glance might show that there’s a sneaky way around the holdup via residential roads!). One thing that particularly impresses me with this model is Volkswagen’s 2.0L petrol engine. People still arguing that large engine capacity is everything are living in the past. The ‘new cool’ is smaller engines that deliver larger power through more effective means. Just look at old American cars – huge capacity engines, often over 4L with lots of noise, and yet the power just isn’t delivered to the road, leaving the engine capacity to only act as a marketing message, ultimately meaning nothing for the driver. The Tiguan’s engine is quiet around town, yet delivers a surprising amount of smooth yet persuasive acceleration with a pleasing engine noise when needed. I really enjoy it and wouldn’t need anything more. The Tiguan Allspace in Blue Silk with Ruby Red in the background. 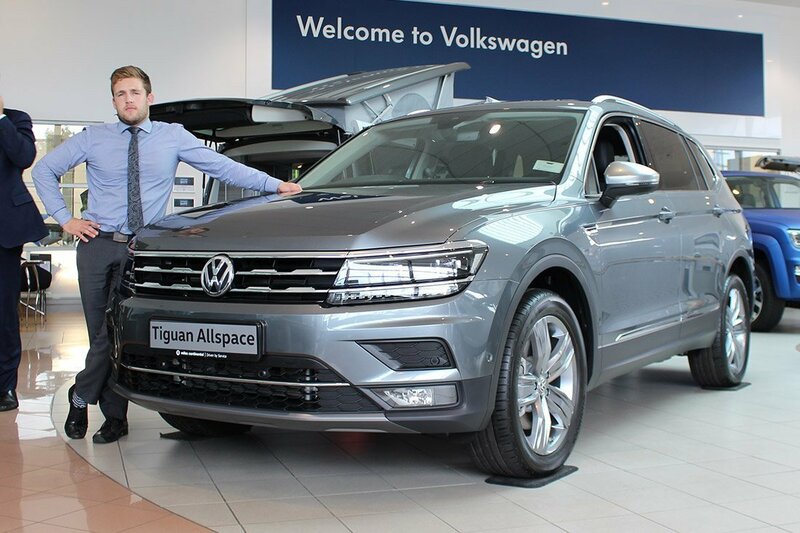 Alex Todd – catalogue model – with the Tiguan in Platinum Grey. Access to the rear row of seats. 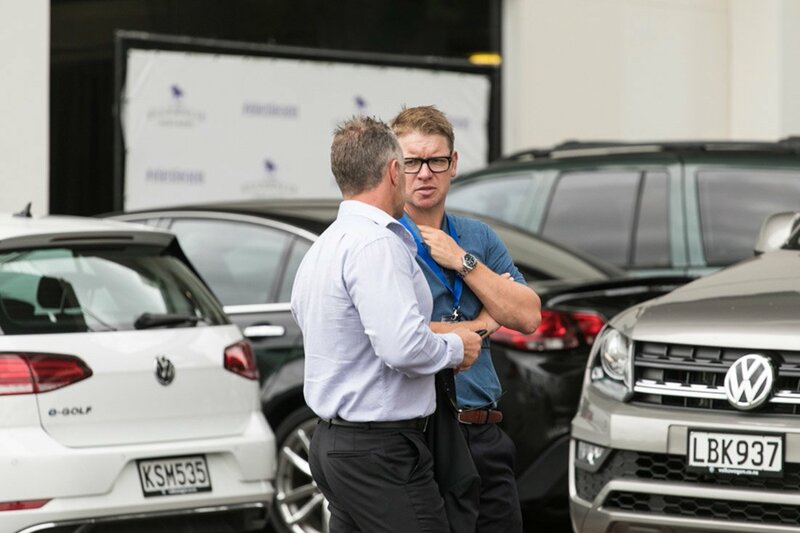 Volkswagen New Zealand’s Top Dog, Tom Ruddenklau. 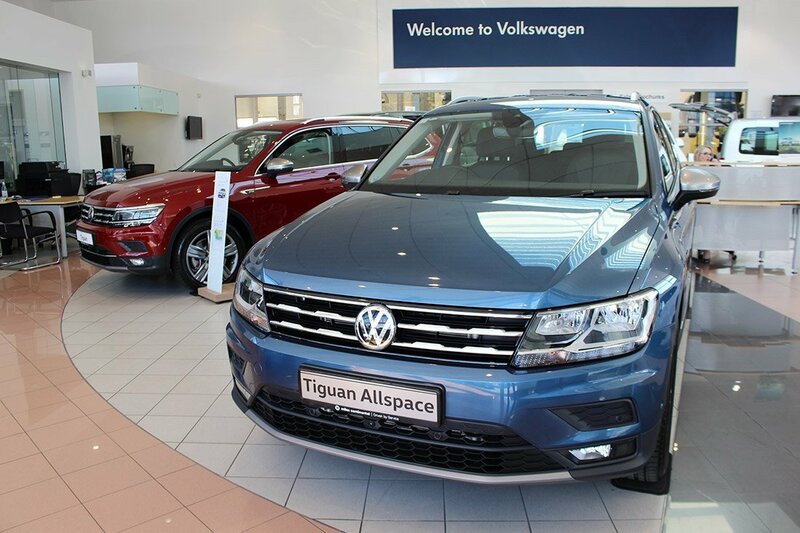 In the meantime, the Tiguan Allspace is available for test drive and purchase here at Miles Continental. As someone who has access to a wide range of vehicles and has spent a lot of time with the Allspace, I’d definitely recommend it. As you can see from the above, it looks pretty hot with a few accessories as well!